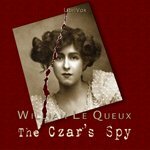 Tom’s note: this is one of my favorite Le Queux stories, the first one I recorded, and what got me “hooked”. Listen Now! Click on one of the chapters to start the audio playback.